Having suggested methods of testing and offered an analysis of all the hand-painted films, I shall briefly outline three possible routes of duplication. For the production of a colour master positive from a colour negative, I would recommend using Kodak 2242/3242 3 polyester intermediate film. The alternative would be the acetate 5242/7242. Polyester stock is much more stable than acetate stock, is believed to last longer, does not shrink to the degree that acetate does, and is very resistant to micro-organisms. 4 For the production of a colour master positive from a colour reversal film, the polyester intermediate stock would be 2272/3272. The resulting colour negatives are made using process ECN-2 and printed onto Kodak Vision colour print stock 2383/3383 resulting in a reasonable copy of the film in its current state. 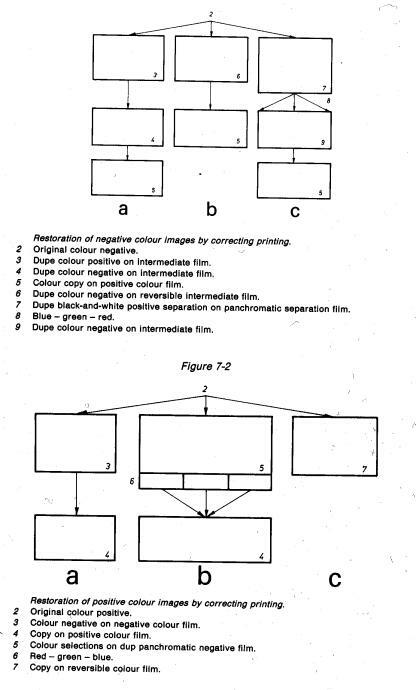 Separations from the original hand-painted films will last far longer than the first method of duplication by colour internegative. With separations, when a new print is needed the three black and white films are printed onto a single Eastman (or Fuji) colour Intermediate film to make a new colour negative from which a new print can be made. 6 Currently, the preferred choice of film stock would be Kodak Panchromatic Separation Film 2238, a polyester black and white stock for making separation masters from both colour negatives and positives. The film can be developed as either positive or negative, depending on the original. At this point, the films would be very well preserved but a restoration would require another set of separations from the new negative or even better, straight from the originals again; this time, varying the levels of exposure and contrast to restore the original dye colours. With regards to the sound track, a new optical track would be made on polyester panchromatic Kodak 2374 stock (the modern version of stock which Tait used to paint on!). In this method, the film is scanned to data files when most of the colours are restored by the telecine operator. The restoration is then completed at a workstation with the operator precisely matching the data to colour samples obtained from the dye tests previously mentioned. The data may be digitally ‘retouched’ and any deterioration in the form of scratches and marks can be removed. The files are then re-recorded back to film on a colour intermediate stock from which prints are made. It may be noted that this method is much closer to the practice of restoring other forms of art such as a paintings. Typically, these are physically worked on by the restorer unlike traditional film restorations which are basically variations on duplicating. Restoration via this method allows the Archive the greatest range of flexibility for manipulating the films from their current condition in order to produce new prints which are judged to be as close as possible to the films Tait originally showed. It necessitates close communication with the workstation operator whose job it is to ‘restore’ the image as there is a greater amount of flexibility over photochemcial restoration and duplication. The digital route is recommended should the SFTVA carry out the dye test I discussed since this will provide exactly the kind of technical data which digital restoration favours. 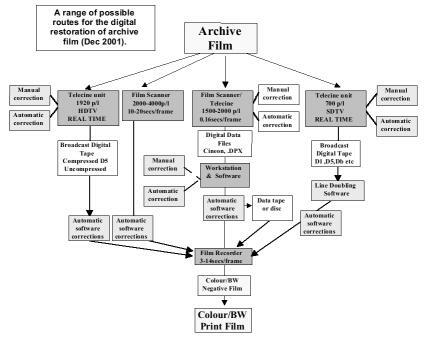 Whereas photochemical restoration by duplication is greatly governed by the limits of the narrow range of film stock available to carry the job out, practically anything is possible with digital restoration (the only ‘limitation’ in the process occurs when recording back to film stock which has given physical attributes) and thus in practice it requires confident technical decisions based on thorough research of the films. This might seem like an obvious requirement for any kind of duplication but because digital manipulation of the image introduces an additional ethical dimension which is still very much under close peer scrutiny, any archive undertaking this kind of work at the moment should expect to be fully accountable and transparent in their decision making. Not a bad thing by any means! Special rates may be available for lengths longer than 10 minutes. At these prices, Calypso (404ft) would cost €10,148 to scan and €8791 to record back to film with additional costs for the workstation time. Clearly a very expensive process although it has been suggested to me that because of the uniqueness of this project, partial funding would be readily available. Can 55: Colour print, Comopt, 16mm, 414ft., 1998. Can 56: Colour print, Comopt, 16mm, 414ft., 1998. Can 57: Negative optical soundtrack, 16mm, 414ft., 1998. Can 58: A&B Roll Master colour negative, 16mm, 414ft., 1994-1998. Can 59: ‘Further Grove’ Colour negative, 16mm, 144ft., 1998. Can 60: ‘Further Grove’ Colour negative + trims, 16mm, 144ft., 1998. Can 55 This is a show print in good condition. There is no fungus present and only a few light scratches. Can 56 A show print, in very good condition. No fungus. Can 57 Original negative optical soundtrack. No fungus. There is a Todd-AO laboratory label on the can which shows it has been cleaned and is dated 20-7-98. Can 58 The original negative A/B rolls. They are a mixture of Kodak, Agfa, Ilford and Fuji stock with dates varying from at least 1994-1998. The hand-drawn sections are black ink on clear black and white 16mm Agfa stock. Unlike Tait’s other films, there are no 35mm elements for this title and it appears that the drawings were made directly onto the Agfa stock. There are hand-written numbers in between the perforations approximately every 40 frames and the drawings were made without adding framelines. Significantly, there is a colour grader’s sheet with all the light changes clearly noted in numeric form. There is no fungus. The label on the can states that the film was ultrasonically cleaned on 24-7-98. Can 59 This is a negative relating to the last section of the film. It includes images of slates/’clapper boards’ with the title ‘Further Grove’ written on it. No fungus. Can 60 Like #59, there is a roll of footage relating to the last section of the film. It also includes trims. No fungus. In terms of preservation, this is the least complex of all the hand-painted/drawn films. The film has not begun to suffer from fungus and appears to have been stable enough to undergo ultrasonic cleaning at the laboratory. Other than black inks used to draw on the Agfa stock, Tait did not apply any colour dyes. It is possible that she used the same drawing inks for Numen of The Boughs and if so they may likewise be stable. Having the grader’s timing sheet is essential for achieving the colours that Tait decided upon and it should be treated with care. 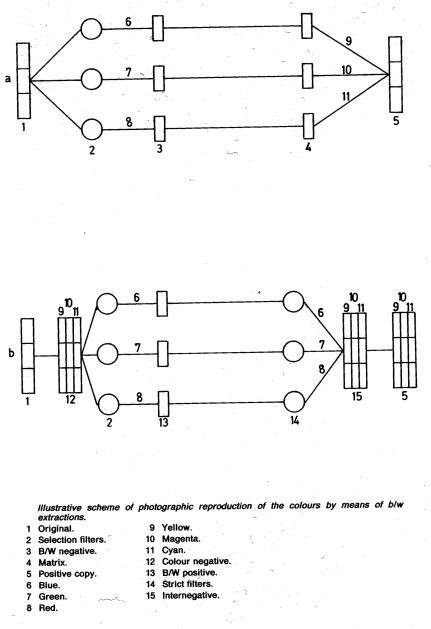 With this record, the technique Tait used to colour the hand-drawn sections can be clearly understood: Grading lights with a value around 25 are considered normal. Where there are one or two zeros in the light (i.e 10 00 10), this indicates an overall shift in colour (the above example would be green) and such exposures would flash the background of the picture area. The original clear Agfa stock with black ink drawings has been flashed with colour to give the finished result of white drawings on a dense, richly coloured background. There is no urgency to work on the preservation of this title and the film elements can be considered stable and well preserved. There are two prints in good condition, one of which should be treated as a master positive. An adequate and economic method of preservation would be to make an interpositive from the original negatives. Having the original grading sheet should ensure that a fairly faithful reproduction would be achieved.